Mother and Dad (Jonathan's parents) arrived safely this evening to visit us for the next week and a half. We are very excited for their visit. Slight oversight, we didn't get any photos of Spencer tonight in his costume. He was there in his costume. However, we do have photos of him from the Halloween Carnival, so hopefully he will forgive us one day. 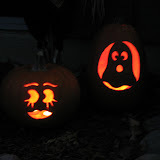 Those pumpkins are FANTASTIC! David is so cute and you can see how much he loves his costume!